Cell ring tone? New opportunities? What am I on about? For indie musicians, something interesting is happening on your way to a career in music. Instead of heading down that age old road with the single goal of getting signed to a record label, (whose role in the new music business has decreased to say the least,) musicians now have a thousand paths they can travel to a career in music. In the uncharted territory that is today’s music industry, the good news is the same as the bad news. And this good news/bad news is? You’re on your own and you will have to do it yourself. Plucking one example from the new environment, we don’t have to look any further than the cell ring tone. Who would have thought even 5 years ago that a downloadable ring tone would represent a way for a musician to earn a living from his or her music? And yet, with the rapid rise of Myxer, now the most popular ring tone vendor, this is exactly what has happened. Hundreds of thousands of music fans now show their love of their favorite songs by flocking to Myxer to download cell ring tone versions of them. With Myxer’s rapidly expanding partnerships with recording artists big and small, and large entertainment corporations, the opportunity this represents for indie musicians can’t be ignored. You see, we tend to take the extraordinary for granted, but by doing that, indie musicians have to be careful not to miss the opportunities all around them. As part of the experiment I didn’t do a thing to promote the song I uploaded to Myxer. I assumed it would become buried under the thousands of other ringtones available at Myxer. I went back to check on the progress of my little 30 second ring tone snippet as I was preparing this article. I was more than a little shocked and amazed to see that the song currently has been downloaded almost 5000 times… woah. Now, multiply each of these downloads by however much the price you set for the cell ring tone, and you can see that this becomes a very useful part of an indie musician’s earning opportunities. 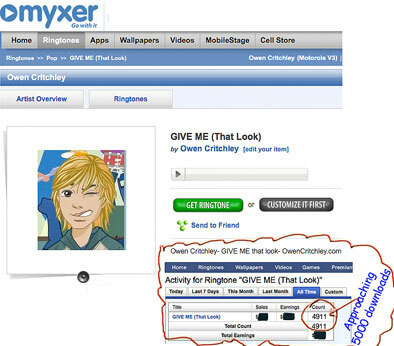 An account at Myxer also allows a personal text message from the artist to accompany each ring tone download. This allows further promotional opportunities as you direct your new ring tone listener to your website or to your online music, merchandise and/or live show ticket store. or you can simply direct your ring tone listener to sign up to your fan list.